The caves of Diros are set along a beautiful bay on the south side of Areopoli, down the west side of Mani. Investigated in the 1950s by Ioannis and Ioanna Perochilou, these caves are remarkable both for their natural features and archaeological significance. Vlichada is considered one of the most beautiful caves worldwide, with a depth of 3.5 kilometres. Many animal fossils dating around 2 million years old were found here. Pink, red and white colours characterise different parts of the cave. 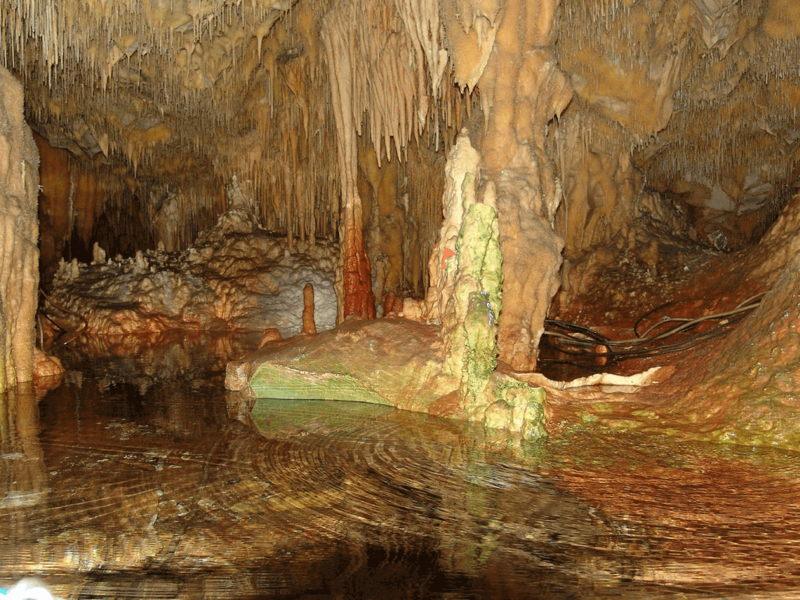 (Note: this may be the only one of the Diros caves open to the public). The other important Diros caves are Alepotripa, which was inhabited some time 5,300 years ago, and was also a burial spot of sorts. The cave revealed ceramic statues, marble relics, animal bones and more, many of which are on display nearby at the Neolithic museum of Diro. There is also Katafigi, considered the third cave of Diros 500 meters away from Vlichada. This cave has an area of 2,700 square meters.